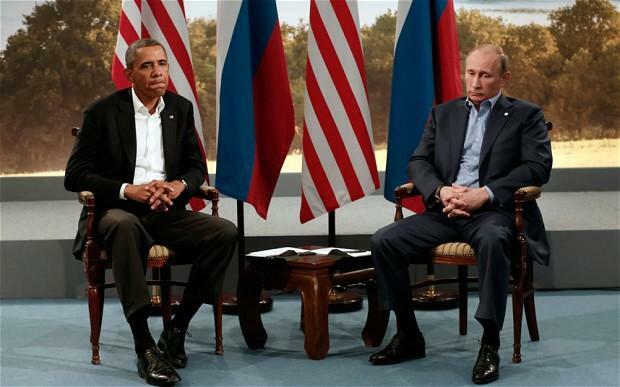 What’s Next For The United States & Russia? It’s safe to say that diplomatic relations between the U.S. and Russia relationship reached a new low point during the month of October. It was a month that saw the breakdown of talks between the U.S. and Russia over the Syrian conflict; the two countries also exchanged threats and accusations over a range of issues, which culminated with Moscow reneging on its agreement to reduce Russia’s nuclear arsenal. Recently, Moscow has succeeded in challenging a wide range of American interests, with the most visible clashes occurring in Ukraine, Syria, and the nebulous web of cyberspace. “The most common U.S. policy responses to Russia — from both Republican and Democratic administrations,” says Matthew Rojansky, the Director of the Wilson Center’s Kennan Institute, “have depended either on the hope that Moscow can be fully defeated or that it can become a friend and fellow democracy.” Considering that President Barack Obama has just a short time left in office, initiating a major foreign-policy shift under his administration is unlikely. As tensions between Moscow and Washington continue to intensify, so, too, does the U.S. presidential race that will determine Obama’s successor. And yet, neither Hillary Clinton or Donald Trump has articulated a vision for relations with Russia that have matured beyond reductive caricatures of the past. Rojansky writes that both presidential candidates tend to eschew the situation’s complexities, “with Clinton painting Russian President Vladimir Putin as a cartoonish villain and Trump viewing Moscow as an ally in-waiting.” Although Hillary Clinton has stated she would be willing to work with Russia on a limited set of issues where interests align, she also seems willing to push back when Russia creates problems for U.S. and Western interests. As I see it, a new U.S. policy toward Russia should begin with the acknowledgement that, barring an extraordinary turn of events, Putin will be calling the shots as the most powerful man in Russia for many year to come. (My prediction is that he will find a way to remain at the helm of the Kremlin far beyond the 2024 election..he is already expected to “win” reelection in 2018). So long as Putin wields power, we should assume that tensions with Russia will not cleave neatly along geographical borders or distinct policy issues. And above all, rather than engage in the kind of wishful thinking that Russia can be negotiated into submission or persuaded to change its ways, a new U.S. approach should at once deal with Russia in all its complexities and contradictions while retaining a forceful upper hand willing to squeeze, however tightly, if needed.